At Pakachoag, we're making Music for Life! 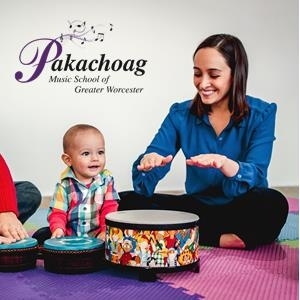 For over 38 years, Pakachoag has been offering quality music opportunities to thousands of families from throughout Greater Worcester (northern Rhode Island, Northeast Connecticut and Cape Cod too!) We offer Music Together early childhood classes, instrumental and voice lessons, Suzuki Violin and Cello, a Student Performance Program, and lots more. Weekly, we offer 15 different Music Together classes in five locations. Annually, we program over 25 student and faculty events. School aged or adult? Many other music-making opportunities available. Today, our home base is located close to downtown Worcester where we also enjoy a program partnership with the Hanover Theatre Conservatory. Special Needs: The Schools early childhood Music Together program is appropriate for children with and without special needs, through age 5. In the summer, we offer music & movement for children with special needs through age 10.